Nobody likes fireworks getting over! We wish they could continue for life and celebrate one festival or another! Here’s a way you can keep the fireworks going for the rest of your life! This is a art activity that will get your creative juices flowing and you lungs working in full mode! 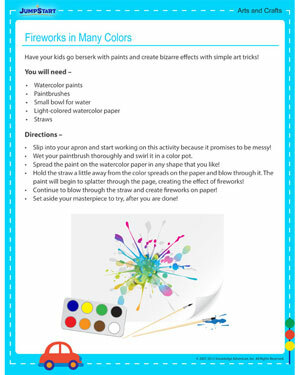 Download the activity for 3rd grade kids and have a blast with arts!